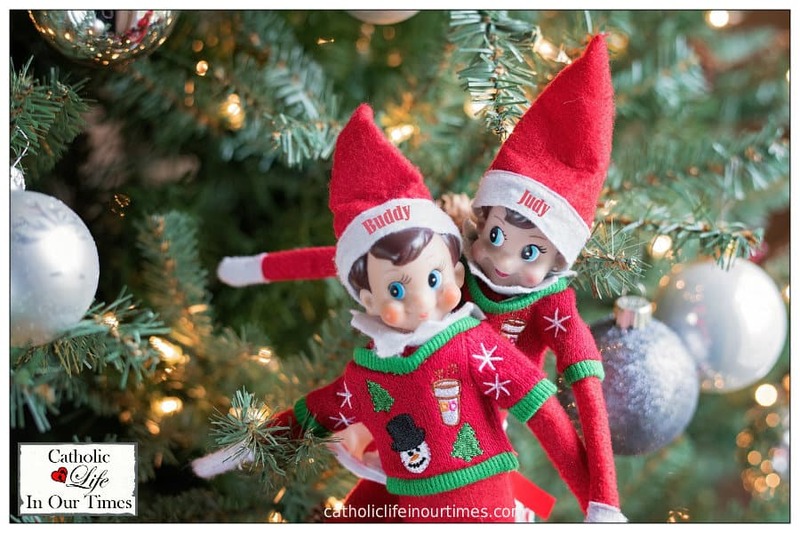 Elf on the Shelf – what are in’s and out’s of this newly minted ‘tradition’? My thoughts on the topic might certainly catch some flack. Yet, I’m okay with that because 1) I’m simply sharing my opinion 2) We can make up our own minds, even after considering a contrasting viewpoint, and remain friends. In past years, I’ve put quite a bit of thought into this issue. First, I want to say that, although my kids believed in Santa for a while, I never really encouraged it. It was just a matter of going with the flow of what the rest of society was doing. While I didn’t encourage belief in Santa, I also didn’t come right out and tell them he didn’t exist. Now before you make the judgement that I’m some Grinchy old woman who refuses to allow kids their childhood fantasies – hear me out. We all know that the legend of Santa Claus has roots in a real-life saint – Saint Nicholas. He was a bishop and, as the story goes, was fond of helping those who had little in the way of worldly goods. This is a wonderful example of Charity but somehow, along the way, this nice saint was hijacked and turned into a jolly old elf who encourages the lust for ‘stuff’. That’s not who St. Nicholas was and that’s not the virtue our kids should be taking away from his story. “If Santa isn’t real, is the story about Jesus real?”. The Elf on the Shelf Is Watching? In the same vein, it really makes me uncomfortable to hear children being told that Santa is watching them – that he ‘knows’ if they’ve been bad or good. Isn’t that the same thing we tell them about God? When the Santa myth is exposed, is it realistic to think that they will still blindly believe in an all-knowing deity? Speaking of knowing good vs. bad, let’s talk about the Elf on the Shelf. So we have instructed our children, for their entire young lives, in the value of being good and following rules. This instruction is to be their guide to Heaven. Now we’re glorifying a creature who comes into our house and wreaks havoc – and we think it’s funny and laugh about it? Is it just me, or is that a confusing mixed signal? There are so many wonderful true stories out there to enchant our children. Why do we insist on allowing them to build their hopes and dreams on a fantasy? Why do we laugh at and, in essence condone, unacceptable behavior. Wouldn’t it be better to tell them true stories – something they could actually emulate? The ‘spirit’ of Christmas comes closer to giving kids a tangible impression of true love and charity. Why not build them up by letting them in on the giving aspect of the Season? While I’m not talking about completely eliminating the Santa mystique, what I am advocating is a healthy middle ground. Perhaps we could play along with the general idea but not participate in the over-the-top things that cement the deal. No letters from the North Pole, no glittery Santa footprints, or cookies and milk. That just encourages an innocent belief in a fading fantasy – and leads to exposure of a fraud. Instead, gently guide them toward a spirit of giving – not receiving. Teach them to be givers – it actually is virtuous and desirable to give rather than receive. That’s in the book of Truth – the Bible. So, although they will naturally look forward to getting, teach them how it feels to give as well. I recently read a sweet little book to the younger kids on this very topic. Santa’s Secret Story did a good job of bringing St. Nicholas into the forefront as the real Santa. One line that really resonated to me was an answer to a question by, Rachel, one of the child characters in the tale. When she asked St. Nicholas why he gave his gifts in secret, he replied, “I want people to thank God, not me! Remember, the greatest gift is God’s love. I am just happy to give His love to others”. What a valuable lesson! We can also transition our energy and enthusiasm – as well as theirs – to fully experiencing the blessed Season of Advent.